How To Store The Violin? “Store the violin? It’s so simple! Just put them in violin cases!” I could almost hear you saying that. Yup! You’re right! The first and most fundamental step to store the violin is to put them in violin cases! Violin cases are designed to protect our violins, and some cases are even fixed with special devices to ensure the violin is being kept at optimum conditions. But if storing the violin is just about putting them in cases, have you wondered why some violins are still damaged frequently, and some even broken? Keeping your violin safe in a tip-top condition is more than just putting it in a violin case. Let’s explore further. 1. Stay clear of extreme heat and humidity. Our violins are delicate violin instruments. Thought they might look hard on the outside, their wood are actually sensitive to heat and humidity. Extreme heat and humidity will damage the violin. Strings will also break or unwind under intense heat due to expansion. 2. Store the violin in the case when you’ve finished playing, or resting in between practices. This is usually not done due to convenience. Most violinists, especially beginner violinists, will tend to hang their violins on music stands, or on chairs when they are resting. This is convenient, since the music stands are just in front of them, but their violins will be easily knocked off from the stands. Store the violin in their cases to prevent this! Let’s develop a habit for this. 3. Store the violin in a good violin case. Of course, getting a violin case with good quality protection systems and devices will do most of the job to ensure your violin is well protected. Check out this guide on how to choose good violin cases. 4. Secure your bow properly. A violin bow has its designated slot in the violin case. Do secure it with a knob properly in the case so that the bow won’t fall off and hit the violin when the case is closed. Also, do put the bow at the upper rack of the case, so that in a case where your bow fell off, it lands on your chin rest instead of the violin body. The violin body can be sparred unnecessary scratches and damages. If you want to have additional protection in the violin, just when you store the violin in a case, cover over it with a smooth cloth. Most modern good quality cases would come with a cloth over your violin. A cloth would also prevent dusts and stains on the body, when the violin is kept for long periods. There you have it! 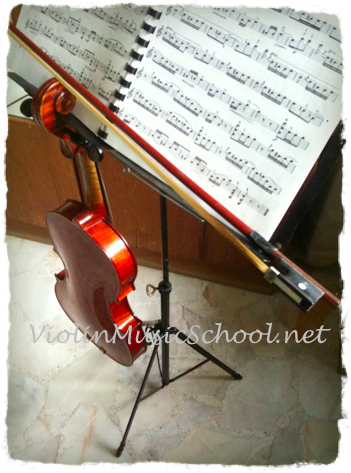 5 easy and practical tips on how to store the violin properly. Do always remember to take good care of your violin, regardless how high or low the price you pay for the violin. How we care for our violin, will show how much we love violin music.